Show me a kid that never got stars in his or her eyes when they watched a film with their favourite star, and I’ll show you a kid with stunted ambition. We live in a culture that emphasizes and bolsters the ideal of fame and fortune – one on hand this isn’t always a positive force. But at the same time, I think it instills us with a sense of motivation, to endeavour towards a certain lifestyle we all aspire to, but few of us ever reach. Out of the library of online slot games found at Silver Oaks Casinos, Bigshot remains one of the few that holds this precept to its highest standard. 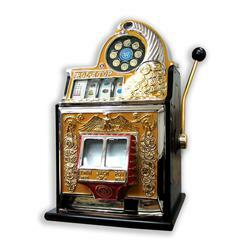 Like the majority of slots, it features 20 lines on 5 reels and gives the option of how many lines you’d like to play. As well, especially for newcomers to the game, there’s a variable wager system that allows you bet as little as 5 cents up to $50, and caters to players of all skill levels (and deepness of pockets). I really liked this feature because as an amateur it can often be intimidating to play slots – although most slot games are pretty straightforward, and a lot easier to learn than some of the table games, there’s still a period of adjustment and learning involved. Bigshot is the top-brass big-cheese head-honcho kind of game, and puts you right in the penthouse with its elegant design and fluid gameplay. But of course, when looking for any slot game to play, there are a few key factors, most critically what sort of bonuses are offered. The back and forth nature of slots, and the randomness of any given spin (plus the obligatory house-edge), means that few people end up winning big jackpots on normal play – the money is made on bonus rounds and special offers. There’s a common thread that runs through Silver Oak Casino’s slot games, and it involves the interaction of Scatter symbols with Wild symbols – the Scatter symbols open up awards and require 2 or more to win, so the chance of them showing up is quite good. The Wild symbols are what open up the bonus round, however, and this should be the focus of any player. In order to get to the bonus round, the Wild symbol (a picture of the ‘Bigshot’) has to appear on reels 1 and 5 simultaneously. That might seem like an unlikely event, but when you do get to the bonus round it’s always worth it because there are more multipliers here on average than any of the other games I’ve played. First, you get free spins – 5, 7, 10, 15, or 20. The twist in this aristocratic tale of riches is that the amount won on these bonus rolls is multiplied by which game you’re playing on. For example, if you’re playing on the 5th game, the prize is multiplied by 5. If, on the other hand, you win on the 20th round, the price is multiplied by 20. Another feature which is showcased on all of Silver Oak’s slot games is an Autoplay function that basically takes over for you by spinning. I thought this was a neat (if ironic) addition because it felt like an automated butler taking care of a menial task. Maybe I’m overdramatizing it, but Bigshot has the tendency to provoke the imagination, and encapsulate the refined and sophisticated routine of a Hollywood star at the apogee of their career.